I sometimes wonder how often we have to re-learn a lesson we’ve previously learned. It can be an especially intriguing conundrum when we make a mistake that not only have we previously learned, but one for which measures have been put in place to minimise associated risks. 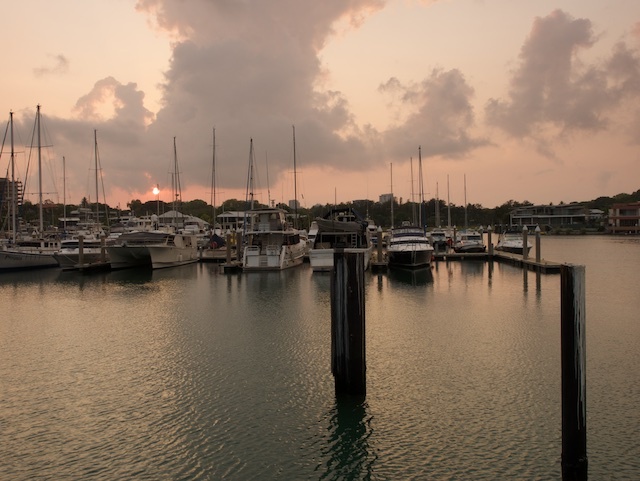 Recently I went out for some sunrise photography at Cullen Bay in Darwin, a picturesque bayside suburb with a marina and even a lock to allow the bay and marina to stay. It is a stunning location for sunrise photography, especially with an aspect that features the sun rising over the picturesque marina. My preferred vantage point for such photos is on the corner of a boardwalk that extends out over the bay. The boardwalk is constructed of wooden boards that have a 3–5cm gap between them, so I tend to take care when fitting filters, lenses and other accessories to my rig. In an effort to ensure I have what I need whenever I go for a shoot, and to ensure each piece is secured properly I have a standard way that I stow my gear, firstly in an inner bag, which then goes into a messenger bag or backpack, depending on the shoot. Stowing stuff is important to make sure I can find things quickly, and that it doesn’t fall out. This time I took along a spare battery that I took out of the charger, and literally three into a top compartment of my backpack - not in the normal pocket I put batteries in on the insert bag. The top compartment is where I stow things like a flash unit and filter kits. I carefully laid my backpack down on a table, setup my tripod and camera, and decided to add a graduated neutral density filter. With the backpack laid down I opened the top compartment, and straight away the spare battery fell out, bounced onto the boardwalk below, and then straight through a gap and into the water. So the spare battery, not a cheap accessory, was quickly lost into Cullen Bay. Have a set way to stow gear for securing and quick retrieval. The lesson could have been more expensive. And it is a cheap lesson if I re-learn it, and apply the lessons consistently.